Venison is on the winter menu at Cafe Berlin, in Washington, D.C. 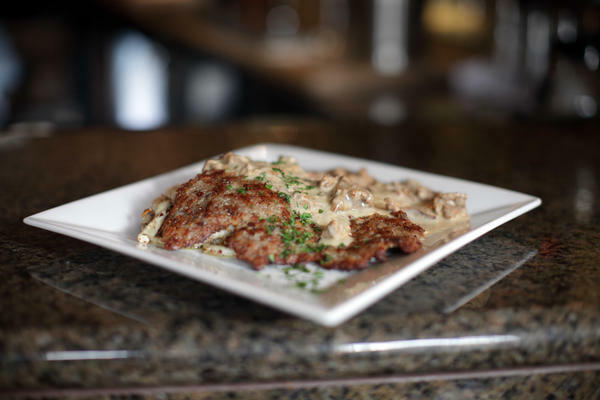 In this dish, called Jäger Jäger, the venison schnitzel comes with hazelnut spätzle, sautéed mushrooms, and cream sauce. James Watson, a chef at Cafe Berlin, in the restaurant's kitchen. Phil Ferlazzo, a volunteer with Empowering Culpeper, distributes free venison to people who need it. Boxes of frozen venison are stacked on pallets behind him. And the star of that menu is venison. The restaurant serves venison ribs, venison loin, even venison tartar. It's food that takes your mind back to old European castles, where you can imagine eating like aristocracy. You won't see venison in ordinary supermarkets. At Wagshall's, a specialty food shop in Washington, I found venison loin selling for $40 a pound. This venison comes from farms, usually from a species of very large deer called red deer. Much of it is imported from New Zealand. Yet there's a very different side to this luxury meat. Less than two hours drive from Washington, Daniel Crigler has a whole freezer full of venison that he got for free. Crigler's home in central Virginia is surrounded by woodlands full of white-tail deer. For Crigler, they are venison on the hoof. And he loves hunting. "I love the outdoors. I love being out. But I also like to eat the meat," he says, chuckling. It's pretty much the only red meat he eats. And as he shows off the frozen cuts of venison in his freezer, this crusty man reveals his inner epicurean. "That's a whole loin, right there," he says. "What I like to do with that is split it open, fill it full of blue cheese, wrap it up in tin foil and put it on the grill for about an hour and a half." And here's the odd thing about this meat, so scarce and expensive in big cities; so abundant if you're a hunter in Madison County, Virginia. Hunters like Crigler kill millions of deer every year in America, but the meat from those animals can't be sold: It hasn't been officially approved by meat inspectors. Also, the government doesn't want hunters to make money from poaching. Yet hunters are allowed to give it away, and many do. As a result, venison occupies a paradoxical place in the world of food. It's a luxury food that turns up in notably non-luxurious places. On a recent mid-December morning, there are boxes of it piled in the basement of Culpeper United Methodist Church, in central Virginia. An organization called Empowering Culpeper is using the space for its monthly distribution of free food to people who need it. "We've got over 600 pounds of venison," says Jill Skelton, who's in charge of the program. 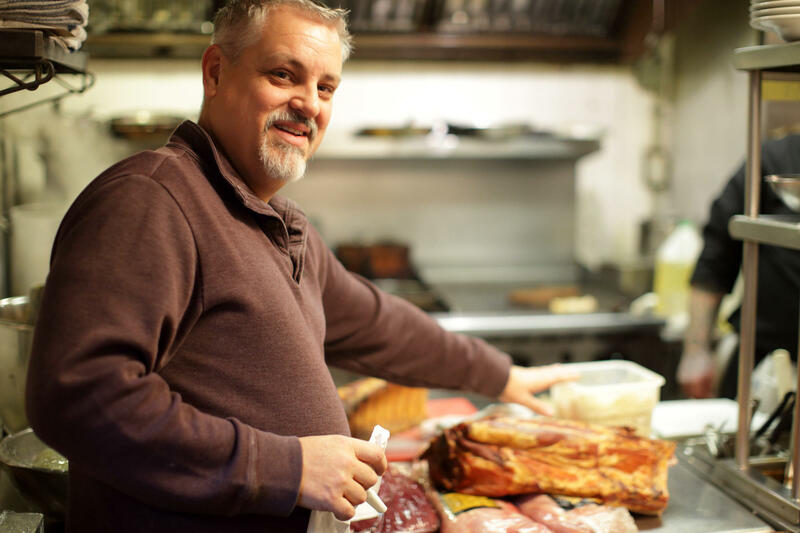 "A lot of times, venison is the only type of meat that we have available to distribute." All of this venison was donated by hunters, including Crigler. An organization called Hunters for the Hungry covers the cost of cutting or grinding the meat from donated deer, and organizes distribution of the venison from small deer butchering shops to food pantries and groups like Empowering Culpeper. There are similar organizations all over the United States, all devoted to helping hunters donate meat from the deer that they kill. Here in the church basement, people have lined up for food, and retired dentist Phil Ferlazzo, a volunteer with Empowering Culpeper, mans the venison station. "How about venison? Do you like venison?" he asks. Most of the people take the frozen meat. Some do not. Venison, for some of them, is clearly not like the meats they'd pick up in a supermarkets. It's not coming from a faraway farm; it's from the woods next to their homes, and they have personal experiences with deer. That's why Alsace Lee Kwai won't eat it. "The first time I ever went hunting with my husband and he shot one, I heard one cry," she says. "Like a baby. No. No thank you." Yet Bonita Gray has the opposite reaction. She grew up eating meat from deer and rabbits that her family shot, and she loves it. "I take all of it, if they give it to me!" she says. "And it tastes so good. Season it real good, put onions on it, green peppers, make deer burgers. Oh, my God!" And that experience is something she'll have in common with people spending plenty of money on those wild game specials at Cafe Berlin. There is a wintertime food that bridges the gap between rich and poor. It's a luxury food that you can also find in surprisingly unluxurious places. It's venison, a kind of meat that you can spend a lot of money on or nothing at all. NPR's Dan Charles has the story. DAN CHARLES, BYLINE: Winter is a special time of year at Cafe Berlin on Capitol Hill in Washington, D.C. James Watson is one of the chefs here. JAMES WATSON: This time of year, we run generally a wild game menu. CHARLES: People come here this time of year for deer and wild boar and quail. WATSON: I mean, they ask, you know, weeks in advance when does the wild game menu start? When does it start? CHARLES: And the star of the menu is venison. WATSON: Venison ribs and a venison loin. CHARLES: Dishes that take you back to some old European castle eating like aristocracy. You won't see venison in ordinary supermarkets. At a specialty meat shop in Washington, those top cuts are selling for $40 a pound. This venison comes from farms that raise a species of very large deer called red deer. Meanwhile, less than two hours' drive from Washington, Daniel Crigler has a whole freezer full of venison that he got for free. DANIEL CRIGLER: That's all venison. CHARLES: Crigler's home in central Virginia surrounded by woodlands that are full of white-tailed deer - venison on the hoof - and Crigler loves hunting. CRIGLER: I love the outdoors. I love being out, but I also like to eat the meat. CHARLES: It's pretty much the only red meat he eats. CRIGLER: That's a whole loin right there. CRIGLER: What I like to do with that is split it open, fill it full of blue cheese, wrap it up in tinfoil and put it on the grill for about an hour and a half. CHARLES: But here's the odd thing about this meat - it's so scarce and expensive in big cities, so abundant if you're a hunter in Madison County, Va. Hunters like Crigler kill millions of deer every year in America, but the meat from those animals can't be sold. It hasn't been officially approved by meat inspectors. Also the government doesn't want hunters to make money from poaching. Hunters can give it away, though, and many do. JILL SKELTON: We're starting to gear up. We've got bags built this morning. CHARLES: This is the basement of a Methodist church in Culpeper, Va., and an organization called Empowering Culpeper is passing out free food to people who need it. Jill Skelton's in charge. SKELTON: We got over 600 pounds of venison. A lot of times venison is the only protein meat source that we have available to distribute. CHARLES: And it was all donated by hunters, including Daniel Crigler. An organization called Hunters for the Hungry pays small deer processing shops to cut and grind the meat into usable portions. There are organizations like this across the country, and Phil Ferlazzo, one of the volunteers here this morning, is offering the meat to a line of people coming through. PHIL FERLAZZO: Now how about venison? Do you like venison? UNIDENTIFIED WOMAN: Yeah, yeah, that's good. CHARLES: For a lot of people here, venison is not like the meats you find in the supermarket. It's not coming from a faraway farm. It's from the woods next to their homes, and they have personal experiences with deer, which is why Alsace Lee Kwai won't eat this meat. ALSACE LEE KWAI: 'Cause the first time I ever went hunting with my husband, he shot one, I heard one cry like a baby. No, no, thank you. CHARLES: On the other hand, Bonita Gray grew up eating meat from deer and rabbits that her family shot, and she loves it. BONITA GRAY: 'Cause I'll take all of it if they give it to me (laughter). And it tastes so good. You season real good, put onions in it, green peppers, make deer burgers. Oh, my God. CHARLES: And that experience is something she'll have in common with the people spending plenty of money on the wild game specials at Cafe Berlin. Dan Charles, NPR News. (SOUNDBITE OF THE SOUL'S RELEASE'S "EVER ALONE") Transcript provided by NPR, Copyright NPR.